Mulberry Moon Farm is a small-scale farm located on leased land in the Town of Caledon, Ontario, just 10 minutes south of Orangeville and northeast of Alton. 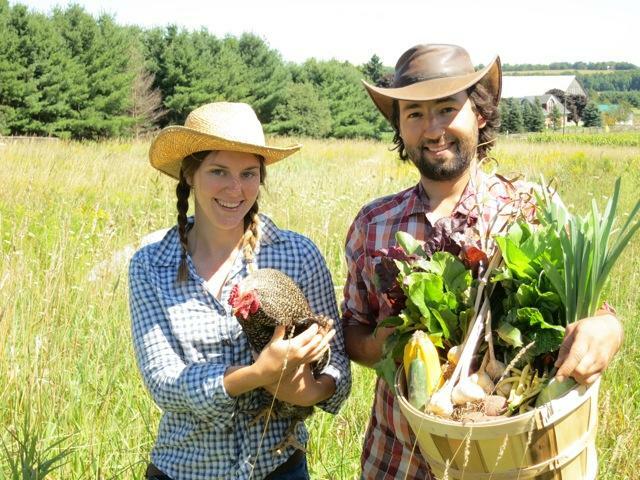 They grow vegetables using sustainable, organic farming practices, and raise chickens and pigs on pasture. It is their belief that everyone should have access to fresh, nutritious, locally-grown food, and they want to play their part in their local community by providing this. They are passionate about revitalizing the mixed family farm, protecting the environment for future generations, and rebuilding the connection between farmers and communities. Plants, animals (including us), air, water, soil – all sustain one another within a delicately balanced system. We believe it is our responsibility to respect, protect, and be acutely aware of our environment and everything in it. We believe nature has much to teach us, and that we should work with our environment, rather than against it, using nature’s systems as a guide. Plants, animals (including us), air, water, soil – all sustain one another within a delicately balanced system. We believe it is our responsibility to respect, protect, and be acutely aware of our environment and everything in it. We have a responsibility to reduce our impact on the environment and protect it for generations to come. We believe strong, connected communities create a healthy environment to live in, and the capacity for change. Money spent locally has the power to improve the local community and economy as whole. In a world where people are increasingly disconnected from one another, we hope to rebuild the relationship between farmers and their local communities. Every day, food is shipped across the world to local grocery stores. As a result, food is picked unripe,diversity is lost as large-scale production favours varieties that store and ship well, and mass amounts of fossil fuels are used. Meanwhile, many of these items can be grown locally – and are! We believe growing and eating local foods means food is at its freshest and environmental impact is at its lowest. And by getting to know your local farmer, you know what you’re eating, and who you’re supporting. You also get a chance to be part of the process and to let your voice be heard. Food should be good, and good for you! We believe that plants grown the way they were meant to be – with no artificial pesticides, herbicides, fungicides or any other chemicals – produce the best fruits and vegetables. In the same way we believe that animals raised outdoors with space and respect, on natural diets, and without stress, hormones, and antibiotics, will have the healthiest and tastiest meat.